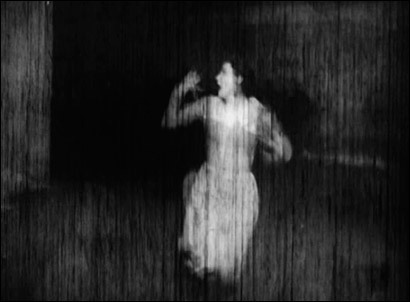 Among the footage that has now been discovered, according to the unanimous opinion of the three experts that ZEITmagazin asked to appraise the pictures, there are several scenes which are essential in order to understand the film: The role played by the actor Fritz Rasp in the film for instance, can finally be understood. Other scenes, such as for instance the saving of the children from the worker’s underworld, are considerably more dramatic. In brief: “Metropolis, Fritz Lang’s most famous film, can be seen through new eyes.”, as stated by Rainer Rother, Director of the Deutsche Kinemathek Museum and head of the series of retrospectives at the Berlinale. 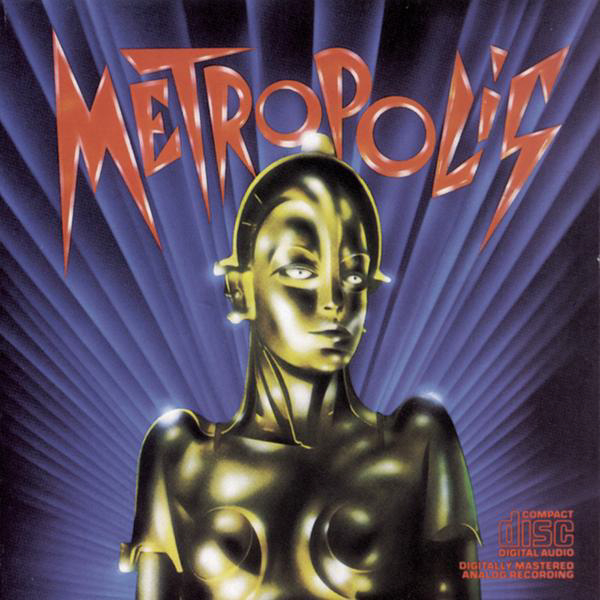 As I noted, METROPOLIS was the first silent film I can really say I saw, in the form of the video version released in the late-1980s with a Giorgio Moroder soundtrack. It’s common, especially among purists, to deride that score but it didn’t bother me for a bunch of reasons. 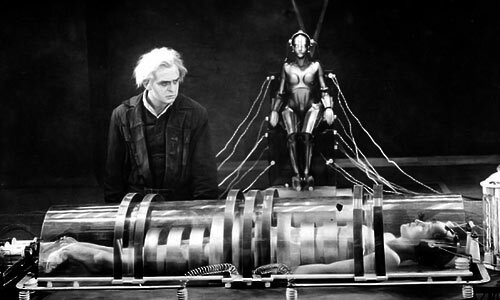 METROPOLIS was a futuristic sci-fi movie (it still is even now, decades later) and it’s not the remotest bit realistic, so period-music purists, with whom I’m in theoretical sympathy, don’t even have a prima facie case. There is no “period” here. The use of songs with words was easily Moroder’s most controversial choice, but if memory serves, only about half the running time had vocal accompaniment; Moroder just as often used synthesizer music. And anyway, I don’t think you listen to nondiegetic rock-music lyrics that closely anyway, at least in a non-musical. What you remember, at least while watching a movie this singular, is a few hooks and the singer’s voice as pure sound. I remember as if it were yesterday my neck tingling to Bonnie Tyler’s “Here She Comes” and Tyler’s raspy voice ripping into the chorus as the false Maria enters the frame. And METROPOLIS, even in its mutilated form that Moroder had, was simply too powerful to be destroyed by this kind of soundtrack. A different sort of silent film, sure. Something as finely honed and delicately emotioned as Griffith’s BROKEN BLOSSOMS or Chaplin’s CITY LIGHTS (to stick with films at the pantheon level) would be overwhelmed by dance-rock music of this sort. Not METROPOLIS. It is a gigantist fantasy, a mad vision of hell, done in high German Expressionist style, with acting and staging as broad as that proverbial side of the barn. It’s “big” enough (“loud” if you like) to take care of itself. Roger Ebert has also described seeing BATTLESHIP POTEMKIN, a movie far closer to METROPOLIS than those two titles I mentioned, coming alive thanks to a live rock band. I knew going in then, and would have figured it out quickly anyway, that the METROPOLIS that was available at the time was a butchered movie and that the narrative wouldn’t be the tightest. So Moroder turning some of the scenes into the functional equivalent of music videos could hardly detract from a headscratching plot. In other words, music in silent films underlines emotions, and a mutilated METROPOLIS was all emotion anyway … the Moroder score did what a silent score should do — pique interest in the movie without absorbing and reducing it. And one last thing. Has anybody ever actually met a person who saw METROPOLIS with the Moroder soundtrack, had his brain ruined and now turns up his nose at silent films without modern-pop soundtracks? I mean … if there were legions of such people, I could see arguing that Moroder harmed METROPOLIS by doing what he did. But isn’t my sort of case somewhat more common — that this sort of experience might pique or stimulate or plant an interest in silent films more broadly, now that he knows how good they CAN be?